Saxton's Cornet Band member joined his fellow band mates in a stirring rendition of "Home Sweet Home" at Dobbin House Square, Gettysburg. Saxton's Band will team up with the Balladeers on Saturday, October 2nd at Glens Falls, City Park. Band, David Kincaid, Strings of Credere, J. Delbert Van Reeth and Victorian Dance Ensemble. A new twist for the Balladeers was performing with Saxton's Cornet Band and the Wildcat Regiment Band in a series of Rounds. Each band played a favorite tune and then passed the baton to the next band. The audience was treated to a variety of Civil War music interpretations. Another highlight was our sundown performance at the Pennsylvania monument. Just prior to the commencement of playing the monsoon rains hit. The audience huddled under the Monument's huge domed canopy and joined us in a camp sing-a-long of Civil War, American and Irish Folk classics. 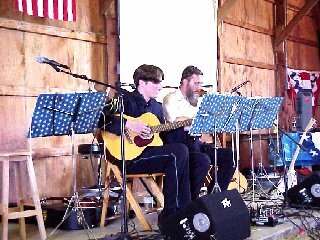 Some of the favorites included Amazing Grace, Battle Hymn of the Republic, Fields of Athenry, and This Land is Your Land. The heavy rains, warm sultry summer evening, the intimate and hallowed setting brought out everyone's passion for history. Thank you National Park Service, family, friends, fellow Civil War musicians, Dobbin House staff and Music Muster audience members for making this a most memorable event. We have just been informed that we've been invited back for the year 2000 event. Put this event on your calendar for next year. You won't be disappointed! Mike Yates (right), 77th New York Regimental Balladeers Co-Founder, presents a donation to support local museum preservation efforts. Receiving the check are Tom Breslin, Event Coordinator, and L. Danielle Cylich, Director, Southeast Museum. even better. The Balladeers will be back armed with new material based on popular request. Congratulations to Tom Breslin, Curt Pratt, members of the Planning Committee and Park staff for a great two day program. For information about next year's activities please call Tom Breslin at 914-228-1239. The Friends of Ulysses S. Grant Cottage will present a concert on Friday evening, October 15, 1999, at 7 p.m. in Alsop Hall, Wilton, NY. The 77th New York Regimental Balladeers will perform "Tenting Tonight", with music, words from soldiers' and civilians' diaries and letters, portraits and landscapes images of the Civil War. 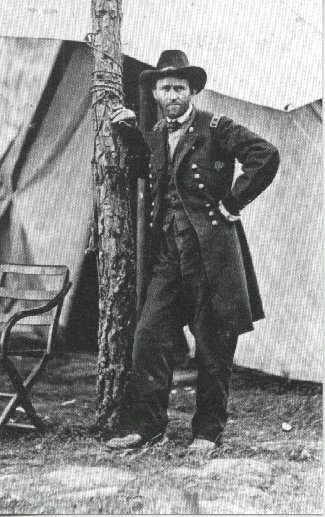 A special section will focus on General Grant, with readings and photographs. The audience also gets to sing along and take home a commemorative songbook. Tickets are $5 each, and may be obtained by sending a check and a stamped self-addressed envelope to Friends of U.S. Grant Cottage, P.O. Box 990, Saratoga Springs, NY 12866. Please write CONCERT on the envelope. You will receive tickets and directions by mail. Please call 518-584-8190 or Beverly Clark at 518-587-8277 or 518-372-0997 for more information. This program is partially funded by the New York Council for the Humanities as part of State Humanities Month. October 2,1999. The schedule will begin at 9 a.m. at City Park. Living history venues will include infantry encampment, laundress, sutler, medical, US Sanitary Commission and Civil War music in the gazebo by the 77th NY Regimental Balladeers and Saxton's Cornet Band. For more information and a brochure with a schedule of events contact Chris Heidorf at 518-798-3878. The Capital District Civil War Round Table will hold their fall conference on November 12-14. The conference will convene at the Ramada Inn, 1228 Western Avenue, Albany. The program begins on Friday evening at 7:30 p.m. with a presentation by Dan Lorello entitled "The Union Preserved: A Guide to Civil War Records in the New York State Archives." On Saturday there will be seminars held from 9:00 a.m. to 4:00 p.m. The Annual Fall Banquet will be held on Saturday night featuring William Preston who will discuss General James Longstreet. On Sunday there will be a special showing of the film Gone With The Wind The 77th New York Regimental Balladeers will perform a one-hour concert from the Proctor's main stage before the film showing. 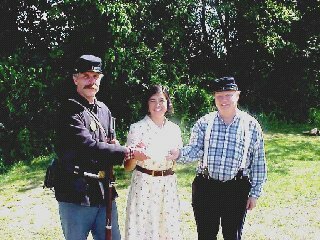 There will also be a Civil War display and reenactors from the 125th and 77th New York Volunteer Infantry Regiments. The Sunday movie/concert double header promises to be inspiring and entertaining. The Civil War exhibit will open at 11:30 a.m. The concert will start at 12:30 p.m. The film showing will begin at 2:00 p.m. Put the date on your calendar and enjoy a great family outing. For further information contact Sue Knost at 518-393-6851 or Dan Lorello at 518-381-3958.
studied classical violin with Alfredo Cavaleri at St. Rose College. She has performed with the Union College Orchestra and at a number of studio recording sessions. Ms. Graham is a certified Social Studies teacher and a former 19th and 20th century antiques dealer. Her passion for the history of the antebellum and Civil War periods and musical talents are a natural fit with the Balladeers' type of music. Elizabeth works as a commercial stylist on video, television and photographic projects. Ms. Graham resides in Niskayuna with her daughters Katryn and Mikael. will be provided by the 77th NY Regimental Balladeers Auxiliary Quadrille Band, consisting of Jim Broden and Hae-Young Koh, violins and Charles Fisher, piano. The Victorian Ball will commence with a Grand March, followed by a variety of dances including polka, waltz, promenade and gallop. There will also be some parlor games and refreshments. During this Fall, the Balladeers will be working on their next CD, Volume 2 (yet to be named). This project will incorporate not only Civil War songs, but will also feature American and Irish folksongs. Several other features will include a highly requested fiddle medley and some poetry. We anticipate that the CD (no tape) will be released at the beginning of our Summer 2000 Concert Series. This is the final issue of Haversack Journal for this year. See you in 2000! 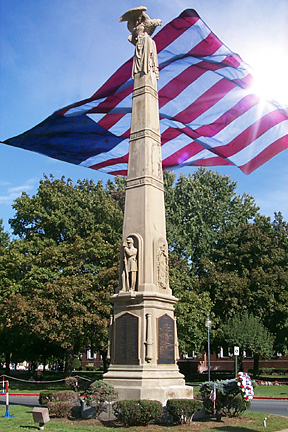 At the conclusion of the Civil War in 1865, bounty funds and other donations were applied toward the decision to erect a suitable monument to memorialize the service of those soldiers from the Town of Queensbury who died during the War. R T. Baxter, a local contractor, began construction on the monument in 1866. It was completed in 1868 at a cost of $12,000.The monument was dedicated on Decoration Day, 1872. The monument is 42 feet tall and weighs approximately 100 tons. The 10 foot base is spruce head granite from Maine while all the upper elements, including the original eagle perched atop the main shaft, are of Dorchester freestone quarried in New Brunswick. The original eagle was severely deteriorated and was replaced in 1999 with an exact terra cotta replica. The officer's scabbard was also redone in terra cotta. The original bronze plaques list the names of 82 soldiers who died in service 1861-1865. These soldiers represent 22 Union units, one Confederate unit and the USMC. Two additional people, Daniel V. Brown and CPT Edward Riggs, perished at sea while on their way to Savannah to procure volunteers. Research conducted by Judge John Austin revealed that up to 18 soldiers from Queensbury may have been inadvertently left off the monument in 1868. Research of National Archives and NYS Library records by John Hastings confirmed that 13 soldiers from Queensbury, who died in service during the war, should have been listed on the monument. The project was sponsored by the Adirondack Civil War Round Table and managed by the Soldiers' Monument Restoration Committee, consisting of members of the Round Table and representatives from the community. Fund raising and restoration of the monument involved 3.5 years at a cost of $200,000. Over 50% of the funds were donated, the balance granted by the State of New York. A long term conservation plan has been developed and perpetual care fund established to care for this community heirloom well into the next century.